Two females and eggs of the newly described species (Phrynobatrachus bibita). Photo by S. Goutte and J. Reyes-Velasco. A new species of puddle frog has just been discovered by NYU Abu Dhabi researchers at the unexplored and isolated Bibita Mountain in southwestern Ethiopia. The research team named the new species Phrynobatrachus bibita sp. nov., or Bibita Mountain dwarf puddle frog, inspired by its home. Female (Phrynobatrachus bibita) next to egg clutches. Photo by S. Goutte and J. Reyes-Velasco. 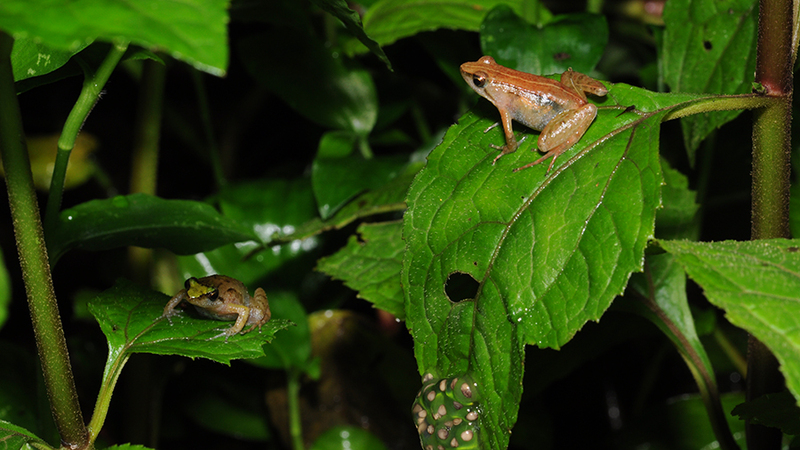 Their paper, published in ZooKeys journal, reports that the new, tiny frog (17 mm for males and 20 mm for females) is unique among Ethiopian puddle frogs. Among other morphological features, a slender body with long legs, elongated fingers and toes, and a golden coloration, set this frog apart from its closest relatives.